I’m not taking the party line (the necessity of standardized assessment) here. I’m just pointing out my experiences. I will address what to teach and how it relates to testing in a minute, but first, a note about how to teach. I have been coaxed, cajoled, and reasoned at, by advocates for numerous teaching strategies (didactic lecture, socratic investigation, projects – both individual and group, games and computer directed variations on all of the above). Most of the strategies were pretty good. Those who constantly advocate relevant or interesting or individually chosen curricula forget two important points. 1) It is vitally important to remember that what works with one student, class or school might not work with another (I’ve said this before). 2) To be creative in anything takes time. In education it takes time to get to know the lesson or strategy and time to get to know the students. In my Algebra classes, I gave every student entering my class a 60 problem constructed response assessment so I could obtain empirical data as to their baseline skill levels. Students were not allowed to use a calculator or notes. The standards covered in the assessment ranged from 2nd to 6th grade with little or no reading required – it was basic computation. I also gave a 50 problem constructed response Algebra readiness test which included verbal problem solving as well as computation. I did this because the standardized, multiple guess, test scores in student records did not give me enough reliable information to help my students. In 20 years of teaching, the mean computational grade skill level of students entering my Algebra class (ages 14 to 17) was 3rd grade and the mode was 4th grade. The mean and mode skill level of Algebra readiness (ages 14 to 17) was barely 2nd grade. Yet I was required to call the class Algebra, and give every government mandated standardized test as if the students had entered my class at grade level! 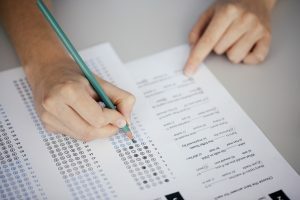 As a result, despite turning their lives around, students who worked hard to make up for lost time, students who made up three or four or five years of missed learning might still test out as ‘below basic’ which was demoralizing to them. Also, there would be no way to show that I was doing a good job because there was no accommodation in teacher evaluations for teachers working with students entering class below grade level. I got in trouble over Standardized tests. I was attending a District mandated after school faculty meeting during which we were to review the latest standardized test scores. I had been killing myself with grading every piece of student work for years by that time, and I knew my assessments and my kids pretty well. I wasn’t trying to undermine the meeting. I was just not participating with my usual motor mouth good humor. My boredom or contempt must have shown on my face because the principal called me on my apparent lack of participation. I told him that the standardized test scores did not tell me anything new. The tests scores weren’t even telling me what I already knew about my kids. I said, “Look at Javier’s scores. It says here that he has mastered trigonometry. I have never covered trig with him. He was just starting to learn fractions, and though working hard, he was struggling with it. Now lets look at Andrés and compare him to Stephanie. Stephanie worked the whole time allotted for the test and stayed after to work extra. She scored below basic. Andrés worked for five minutes. He filled out the Scantron in a beautiful pattern reminiscent of the decorations you might see on a Mayan temple. He also scored below basic. What do I teach them? Where do I start? I don’t trust multiple choice – multiple guess tests. How did Javier demonstrate mastery of trigonometry? There were only three questions on the test which dealt with trigonometry and he guessed right on two of them! Multiple guess tests don’t show process or allow for small errors (more on this in Part 2). That’s because there is one right answer and all the other answers are equally wrong. All wrong answers aren’t equally wrong. Neil deGrasse Tyson gave a motivational speech at Western New England University. It is known in online searches as the Spelling Bee Speech. Tyson gave a hypothetical example of three contestants spelling the word ‘cat’. The three answers given were ‘cat, kat, and xqw’. Tyson then points out that kat is equally wrong as xqw, yet kat makes even better sense as a spelling than cat. Rather than review the whole speech I’ll jump to the ending. Mr. Tyson makes the point that knowing how to think is more important than [I would say ‘as important as’] knowing what to think. This echoes the famous Einstein quote, “Imagination is more important then knowledge” (however it is arguable whether or not imagination is thinking). Memorization and rote learning have gotten a bad reputation over the past few years, yet they are vital to any sort of clear thinking. You memorize the language you speak. I had a Korean student who was improperly placed in my American Literature class. He had only been in the country for about three months and he wasn’t even conversational in English. Yet I was required to test him as if I’d had him in my class all year (which I did not), and as if he could read and speak and write English as well as any American born 11th grader! [see: Where is Planet Reality?] I could have given him a dictionary, or a computer translator but he still would never be able to keep up without memorizing a lot more English. You memorize how to get home. My special ed. class had students so cognitively challenged that they couldn’t be allowed off their bus without an adult present to make sure they got home safely. [read: How School Broke My Heart] Why was that? Because they were unable to memorize the way home and they were so easily distracted and/or dismayed that they could get lost for any number of reasons. “… The American education establishment needs to shed its aversion to teaching facts. …The idea [of this aversion] is that it’s better for students to “construct” or discover their own knowledge than to be passive receptacles for a “bunch o’facts” that will only bore them. Ideally, teachers will just impart cognitive skills that students can use to acquire and analyze information for themselves. But when students don’t know much about a topic, it’s extremely inefficient—at best—for them to try to construct their own knowledge. At worst, they’ll “discover” facts that are just plain wrong. You need some memorization or rote factual knowledge to be able to process information or to perform a process of thinking. This ability to memorize a fact and then apply it in some rational process is the beginning of wisdom. Assessing this knowledge and ability requires time and a different approach than only Standardized testing. How this relates to math testing (as well as other subjects) and how I handle it is in Part 2. Going over emails I skipped before but wanted to read “sometime”. So glad I found this one again! Wish my kids had had you for a teacher! How can we clone you? Thanks for your kind and supportive words. Can’t clone me but I am always available for consultations by email or phone or in person.